What If You Could Find The Prospects Who Are 8x More Likely to Buy? Research shows that prospects with associated key sales triggers are red hot. 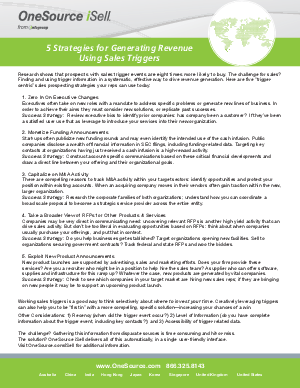 This brief offers 5 quick hit strategies on using key sales triggers to drive your sales strategy. Get Started with Trigger-Based Selling: Download the Brief. Tap the right contacts at the right time in the buying cycle and sell more effectively, more consistently and more easily.